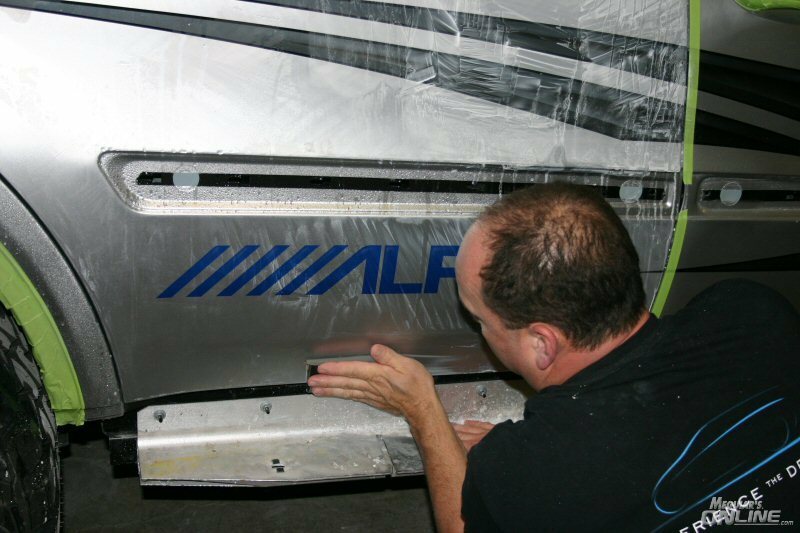 Alpine Electronics of America put the finishing touches on two of their newest creations. 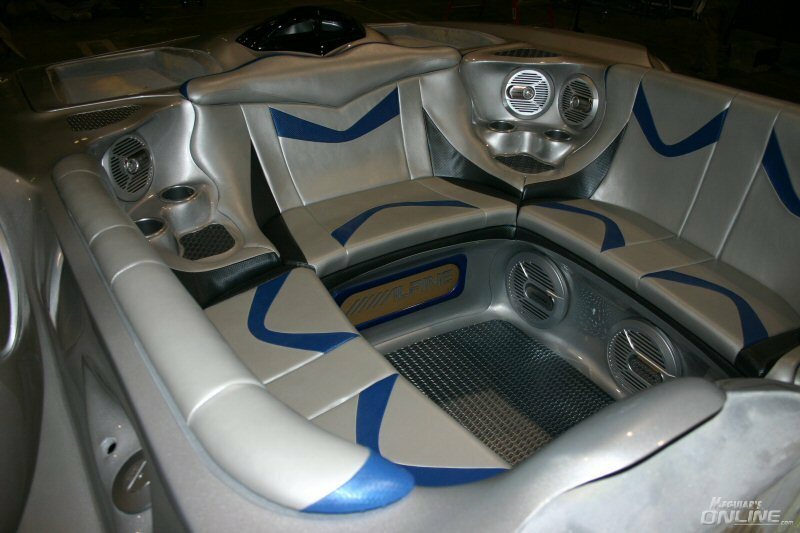 These vehicles debuted at the 2008 Consumer Electronics Show. We handled the sanding and polishing duties. 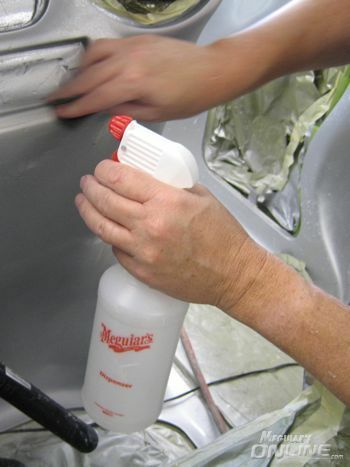 Our primary weapons were Meguiar's Unigrit Sandpapers (in various grades), Unigrit Sanding Blocks, M105 Ultra Cut Compound, W5000 Double-Sided Wool Pads, So1o System Wool Pads, and the SoftBuff Foam Pad System. We also used E7200 Sanding Backing Pads, Meguiar's Spray Bottles and Dispensers, M9910 Ultimate Wipes (the BEST microfiber available, PERIOD), C2000 Overspray Clay, M34 Final Inspection, Ultimate Quik Detailer, All Purpose Cleaner Plus, the Aloe Leather Cleaner/Conditioner Duo, Dash Trim Foam, M40 Vinyl/Rubber Cleaner & Conditioner, Detailer Glass Cleaner, Hot Rims Metal Polish, M97 Medallion Premium Paint Protection, and a few other items that I don't recall at the moment. 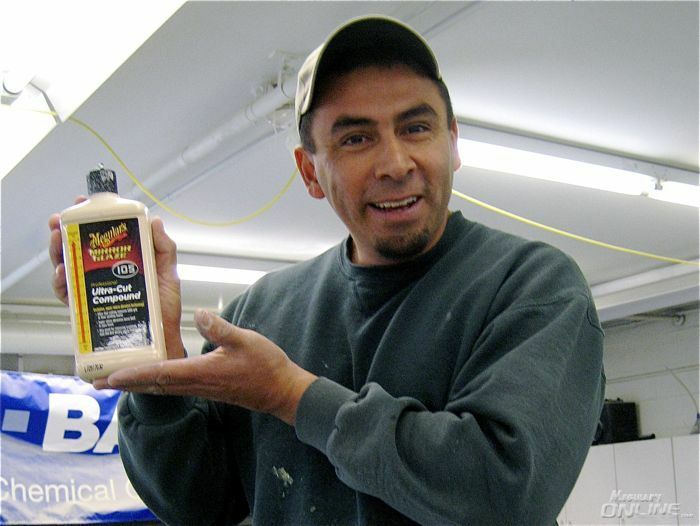 Jason filled in the gaps by handling 'special request' products. We also used an EXTENSIVE amount of Mirka Sanding Products, more specifially, their WONDERFUL Abranet and Abralon Soft Discs (in 3" and 6" sizes). Rather than do an 'official' write-up, I decided to post pics and comments, and to let the other guys do the same. We have many pictures, and it would be very time consuming to put them in chronological order. THANKS TO ALL THAT PUT IN THEIR TIME AND EFFORTS. I'll post more about the individuals later. 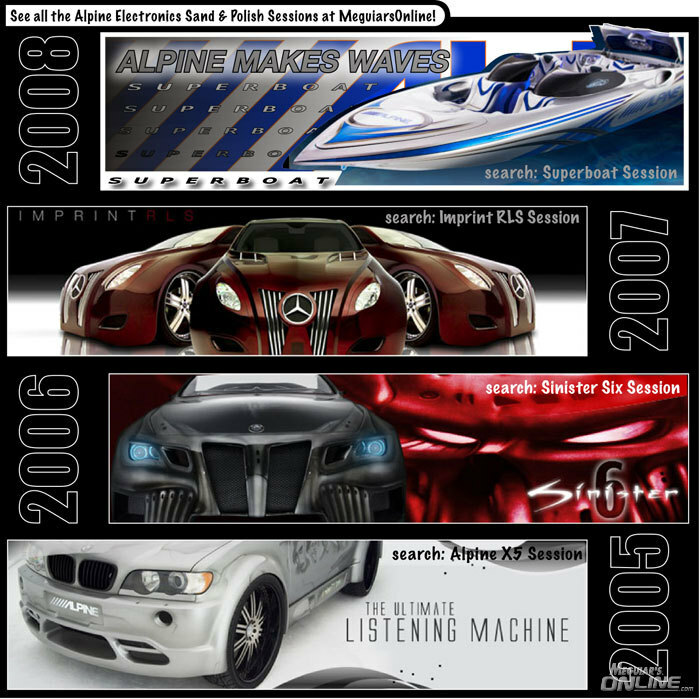 Re: MOL Members ATTACK Alpine Electronics! Nice work Kevin and Team. 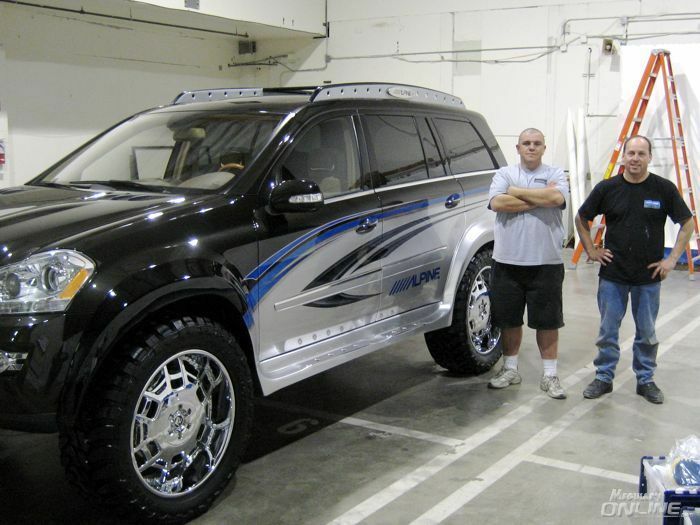 Kevin, thank you for taking the time to upload the photos, and share the project with us. 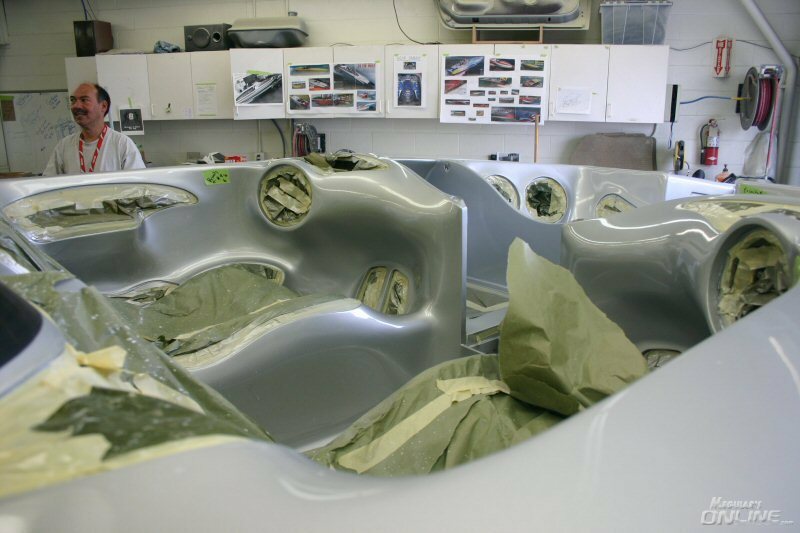 Your special interest projects are always interesting as well as complicated and yet you and your hand picked teams consistently turn out professional show car results every time. Excellent! More boat pics please!!! 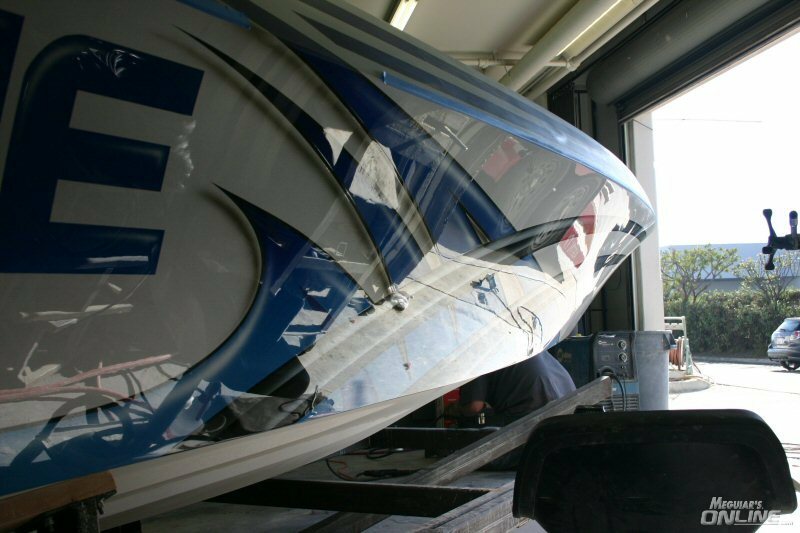 A high peformance boat, super premium sound system, custom paint jobs, comptete with #105 and some MPPP! It doesn't get any better than this! This is a very welcome sight in January! Can't wait to read personal experiences and to see more pictures! Mike and Paul, guys are really lucky! 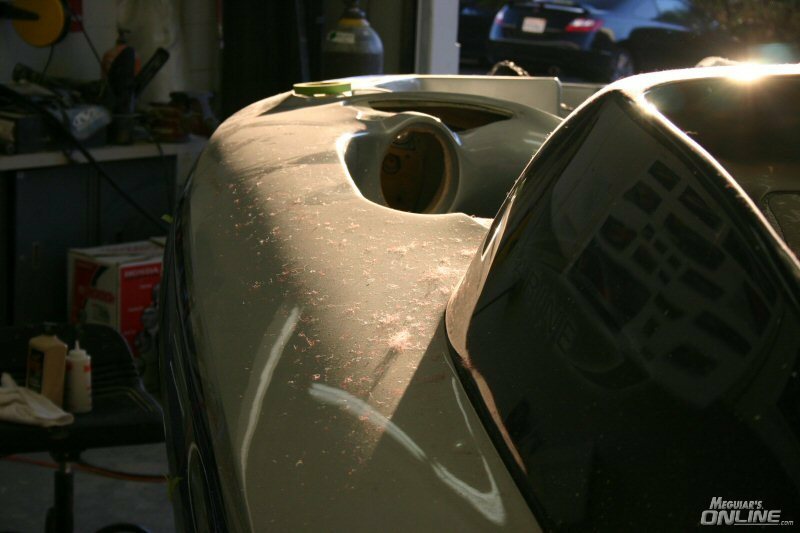 You sure have demonstrated that you have talent and interest in detailing. Nice work on a very cool project. Hey Kevin, you look pretty awake considering that you probably didn't sleep for about a week. I am really proud to have been asked to be a part of this project. Kevin is so much fun to work with and the dude just flat out knows his stuff. Jason is so insightful and so much experience. These two taught me so much in the three days I spent on this project and I thank them for that. 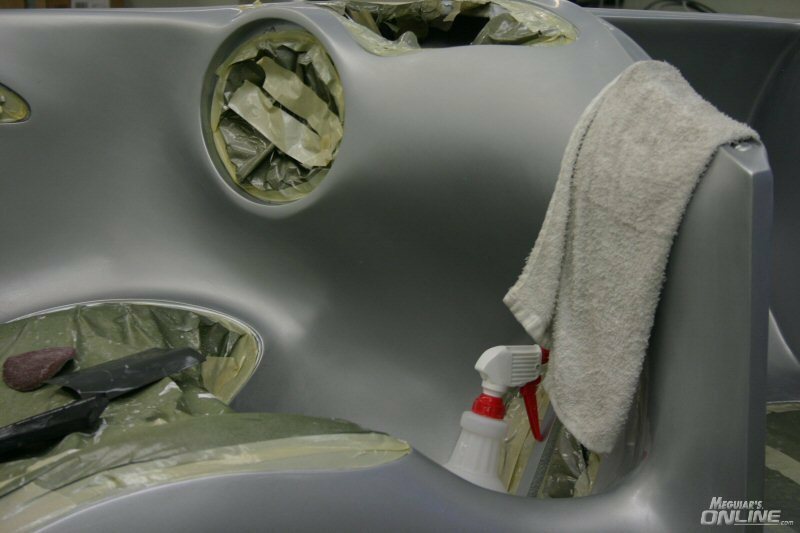 This is part of the boat interior before we started wet sanding. Some of the larger flat surfaces could be sanded by machine but much of this had to be hand work. 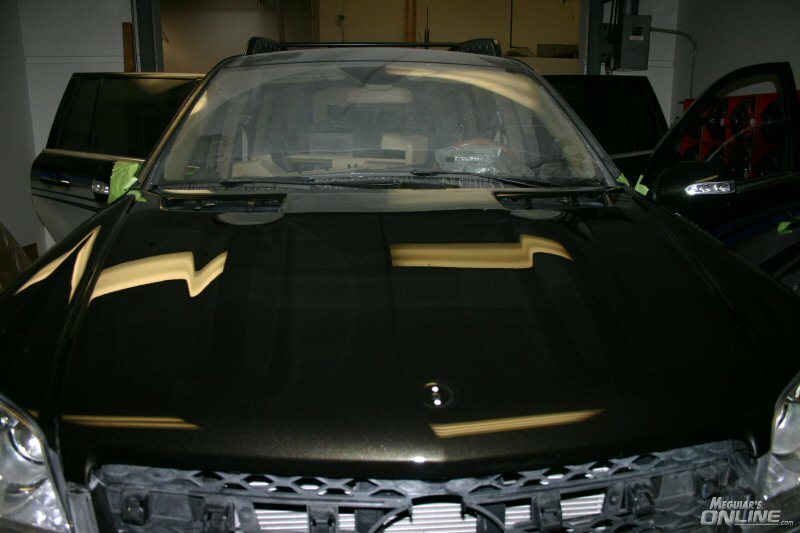 Here's the same area after we knocked it down with primarily 1500 grit. This is the power of M105. I was going back over this side of the boat using a wool pad on a rotary with M105 when Kevin came up behind me and said "wow, look what you've done!!". Oh man, I thought I'd messed up but instead I stepped back and saw this. Seriously, this is what M105 with a wool pad left behind. There is no lighter polish with a foam pad here, no wax or sealant either. Pretty cool, huh? 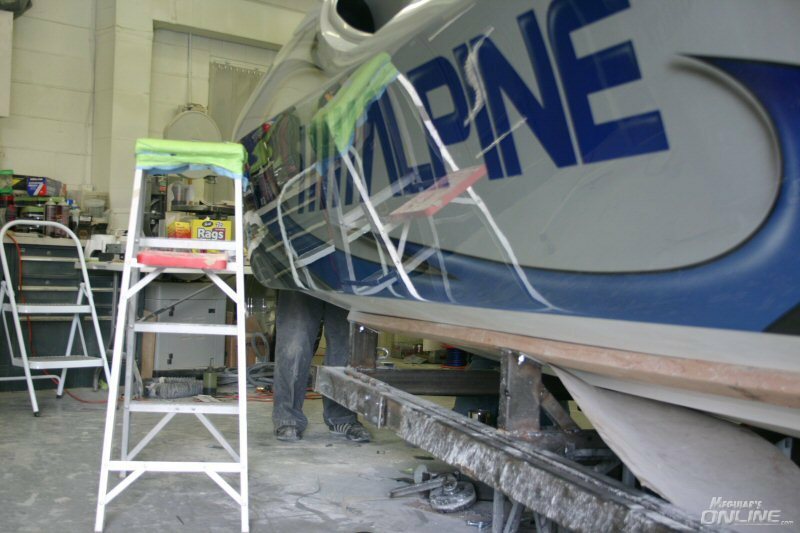 All the while as we polished the Alpine guys were installing the sound system. It was coming along pretty nicely at this point. There was also a Mercedes Benz G-Class SUV in the project, which we dealt with while the installers were working on the interior. Here Jason Rose inspects his polishing work. Again, M105 with a wool pad via rotary. Kevin decided some of the sanding needed a little more work so he jumped on it while we were polishing other parts of the truck. 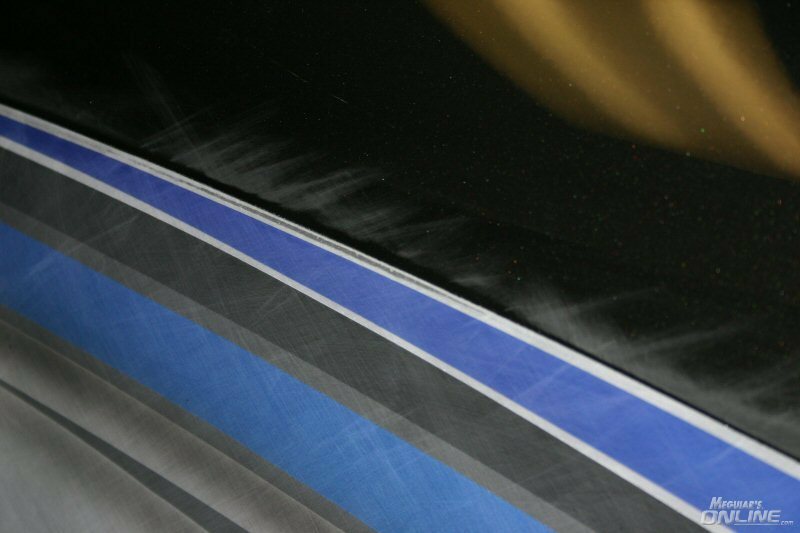 Once again M105 leaves a great finish, this time on the hood of the G-Class. Since only the graphics on the MB were newly painted that's all that needed to be sanded. Here you can see the sanding marks as the new clear is blended into the old. As if the deadline wasn't tight enough the guys had to do a quick "rough" install of the sound system on the boat for a photo shoot one night. 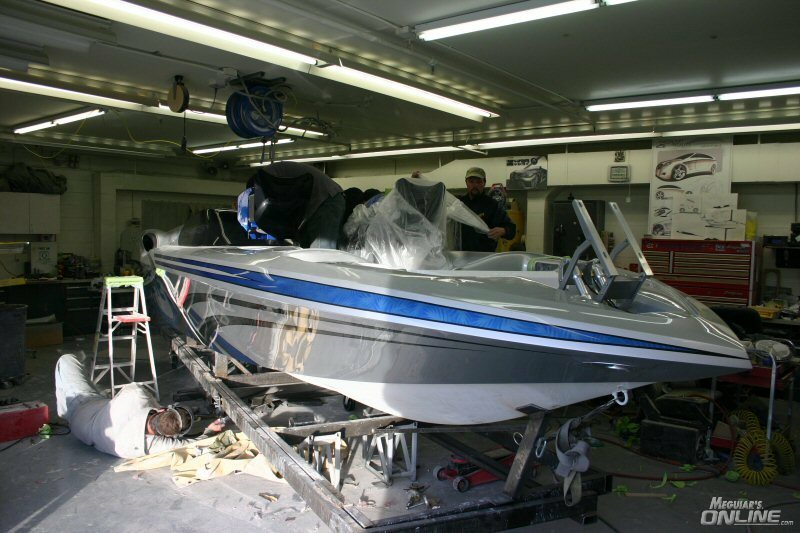 They rolled boat into a larger area, pictures were taken, and then the thing had to be disassembled again for the final install. Kevin, thanks again for letting me be a part of this. Maybe one of these days we can get together without working so dang hard. 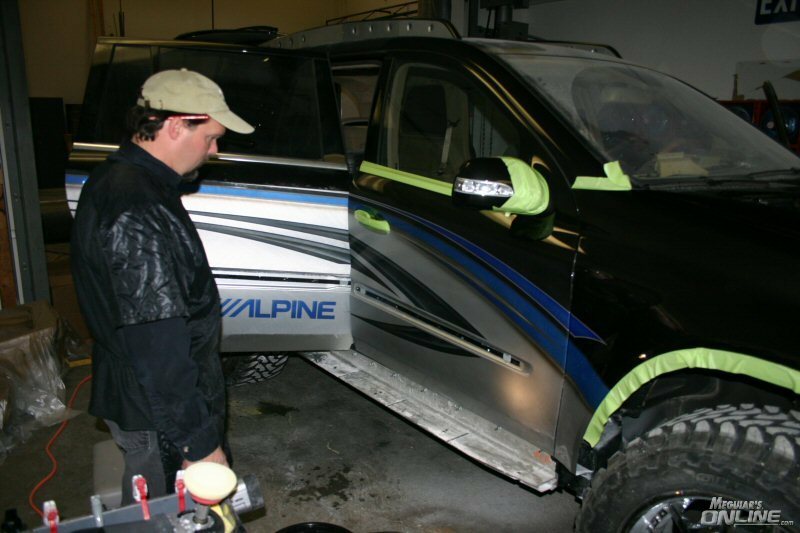 But after SEMA and this Alpine project, I wonder if you ever do slow down and take it easy!!!! 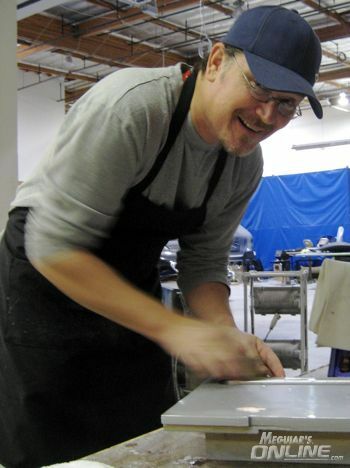 First off, I would be terribly remiss if I didn't mention Joe Fernandez of Superior Shine. 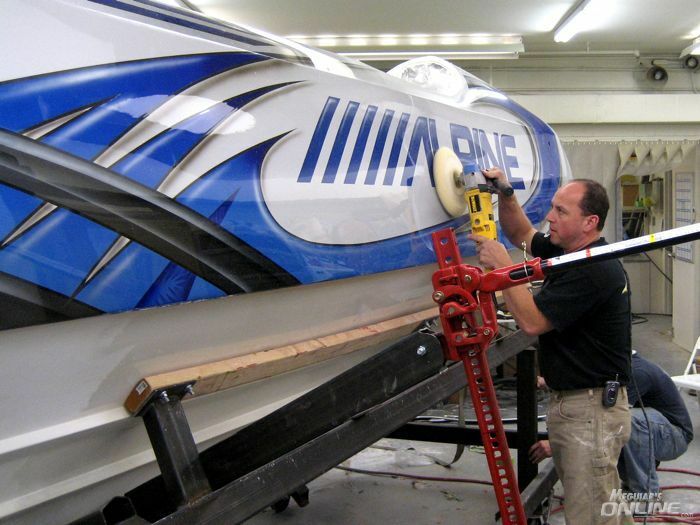 Here he is wet sanding the bow cover of the boat - I could talk to Joe for hours; he's forgotten more detailing stuff than I'll probably ever know and he's supremely entertaining. 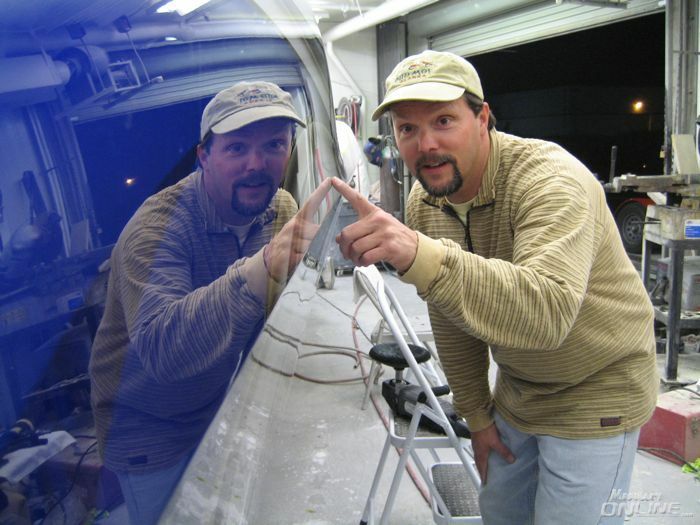 He's also an artist with a rotary. 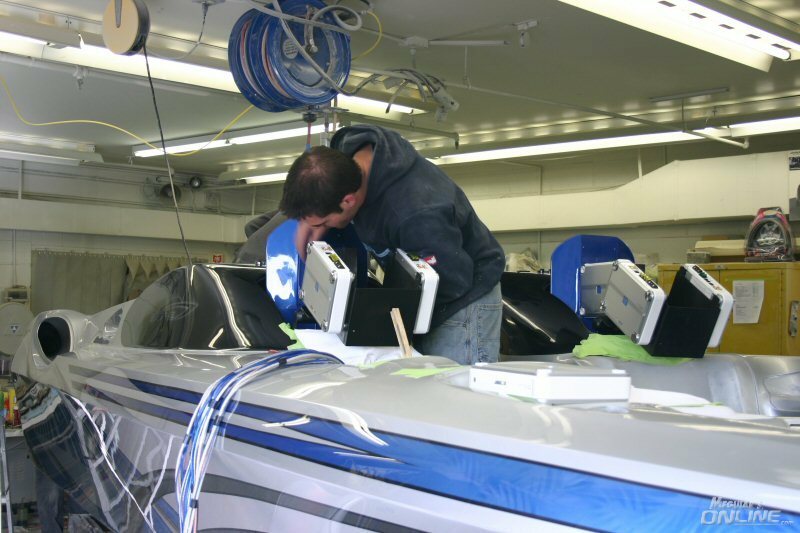 Like I said, the Alpine guys were installing the electronics while we did our thing. Here the amps are being installed in the cockpit pods. 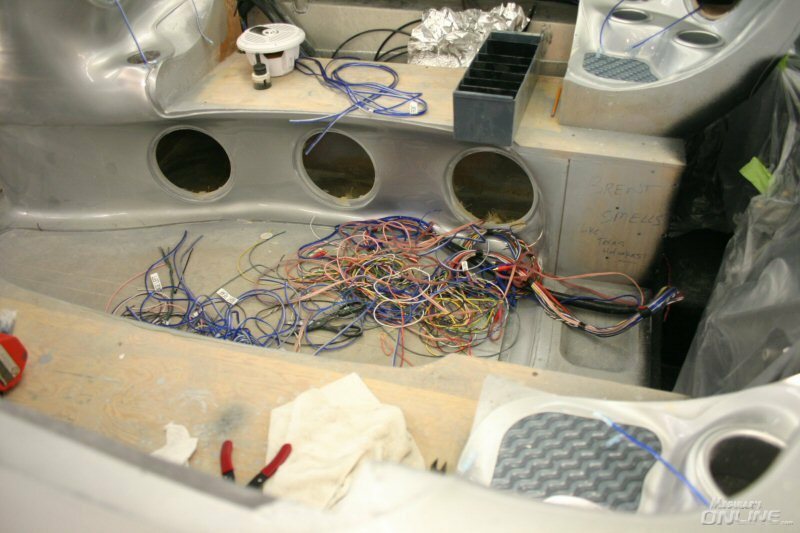 Someone should have calculated how many feet, yards or miles of wiring went into this build!! Here's Kevin brining up the shine on some of the trickier bits. Here's the supercharged Vortec engine that powers the boat. This is the aft passenger area all put together. 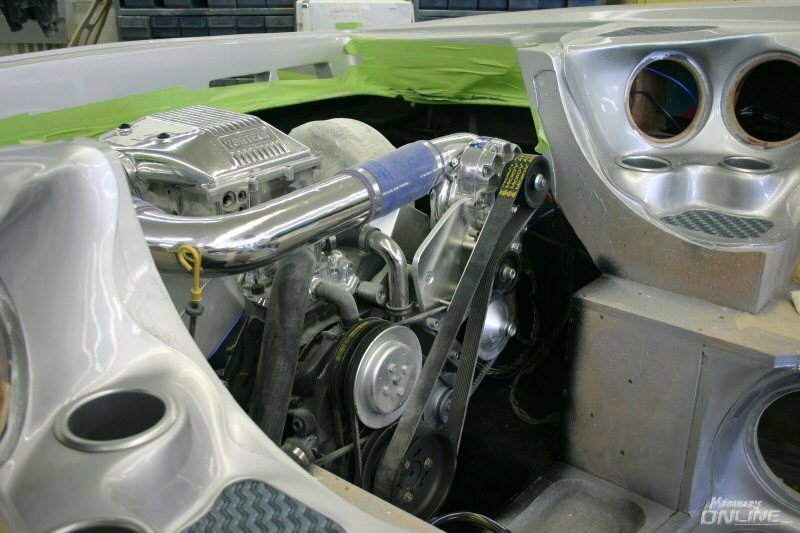 The intake for the engine is the black piece sticking up in the background. Early on in the process with all the wet sanding and new wool pads being used things got a wee bit dusty at times! But toward the end we got reflections like this. Do you get the sense that M105 is really, really good stuff? Yep, this is what happens when you use M105 on a wool pad with a rotary to pull out 800 & 1000 grit sanding marks. Nothing else was used at this point. Wow!!! I can't imagine sanding out all those interior curves! M105 sure worked wonderful on this job. WoW! You guys did an amazing job! I need to try some of that M105! 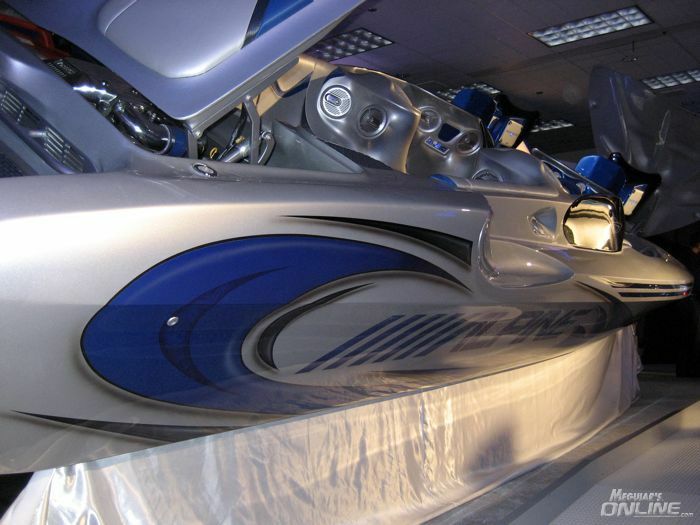 Props to the Alpine guys too for all the crazy custom fiberglass work inside that boat too!